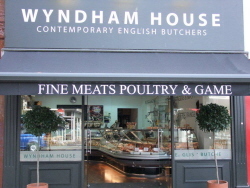 Buy with confidence at Wyndham House Butchers where all the Christmas poultry comes from specialist producers: free range, grown without the inclusion of any chemicals and hand plucked. And because we prepare everything in house we can cater to your exact requirements, putting together all of the accompaniments including stuffings, cranberry sauce, chipolatas, sausage & bacon rolls and cheeses. Preorder everything for collection in one go over the phone or in the shop.